According to the Property Care Association (PCA), the sap of the giant hogweed is extremely toxic to the skin in sunlight, making it a danger to public health. The Association warns that coming into contact with any part of the plant, followed by exposure to sunlight, can cause severe discomfort and blistering to the skin. PCA’s invasive weed group technical manager, Peter Fitzsimons, said, “Each year we urge people to stay away from this plant and not allow its toxic sap to come into contact with skin in the sunlight. Dr Fitzsimons, who is a doctor of philosophy, botany/plant biology, explained that symptoms including a rash, itching and blisters can occur if skin comes into contact with it. In some cases, he says, the blistering can be so severe that urgent medical attention is required. Giant hogweed can grow up to three metres high with a two centimetre diameter stem and a large, white, umbrella-shaped flowering head. It has sharply serrated or divided leaves which reach up to two metres with bristles on the underside and the stem is usually covered in bristles and has blotchy purple markings. The plant can be confused with native hogweed, but this is much smaller in size in all aspects. Dr Fitzsimons said, “Giant hogweed can spread rapidly once established in an area. Unfortunately, there’s not been much attention paid to this harmful weed over the years. Its huge flowerhead releases hundreds of seeds which are wind dispersed and this together with its rapid growth and a lack of natural predators or diseases has led to an increase in the number of areas where it is found. The PCA advises that if contact is made with the plant, the affected area should be covered from sunlight and the skin washed with soap and water as quickly as possible. 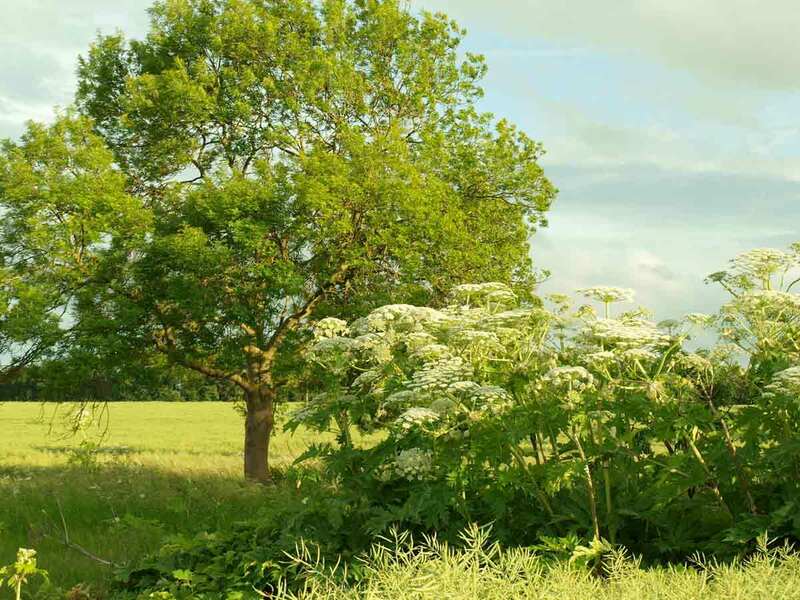 The trade body’s Invasive Weed Control Group has produced a Guidance Note on Managing Giant Hogweed available to view online.